How is Virtual Reality Changing our Reality? I walked through the overly crowded walkway, staring at the colorful map of Cedar Point Amusement Park. A brisk breeze from Lake Erie made my hair dance. A tap on my shoulder. I looked up and my friend pointed to a stand. Virtual Reality (VR) Beta Testing. We hurried over and read the sign. For those 13 and over, experience the Iron Dragon like never before! 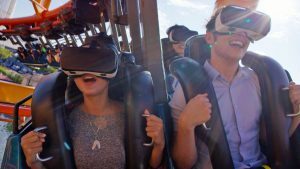 Cedar Point wants you to beta test VR on one of our most beloved rides. Photo owned by Cedar Faire Entertainment Company. “We have to do this!” my friend said. When we got to the coaster, we put on our goggles and were instantly transformed into a monk on a cart. Everywhere I turned my head, I saw the cliff, the bottom of my robes, the village up the hill. Then the cart began to move slowly up the hill. My body, the coaster, moved with it. As we reached the top, a dragon picked us up and flew us through the air. Each movement we made in the ride was replicated in the simulation. We felt helpless as the dragon flew at high speed. When the ride ended, I was blown away. The virtual simulation made the ride more exciting, thrilling, and was totally awesome. I felt like I was in a science fiction movie, but this was reality. Virtual Reality was becoming reality. Imagine my surprise when I began working at the Emergent Media Center (EMC) and learned that students were incorporating VR in not one, but two projects this summer: Olfactory VR experience and the Champlain College Montreal Campus VR tour. Both projects explore and expand on current VR technology to create more immersive experiences that were previously thought to be unattainable. These expansions are only the beginning of VR technology. VR is revolutionizing how the industry views video games. Oculus Rift, Playstation VR, and HTC Vive, are just a few of the current VR tech currently on the market. And more companies, such as Google, Facebook, and Amazon, are investing in and evolving VR to make the experience completely immersive. That’s because VR technology’s potential isn’t limited to video games. VR can be used in education, business, and even as a new medium for social interaction. As Tyler said, these possibilities still have a few years of development and testing before they can be accessible to the public. 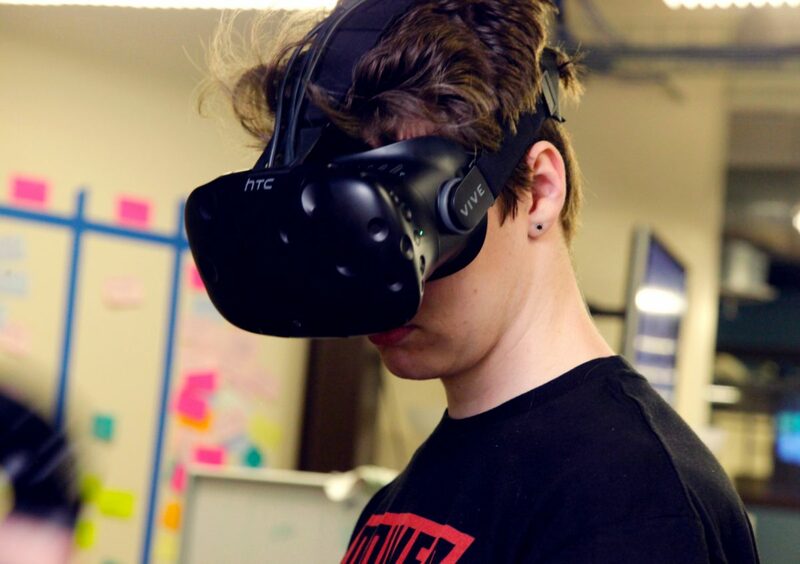 The EMC is working hard to expand on the current technology and uses of VR by mixing art and technology in unique ways. Currently, the Olfactory team is exploring concepts that integrate more senses into VR to make it more immersive. The other project the EMC is working on this summer is a virtual tour of Champlain College’s Montreal campus. EMC’s Montreal interactive UX designer Scott Barter is collaborating with the Champlain College Montreal campus to create a virtual replica of the campus. The virtual tour could lend itself to helping students and parents get a better idea of what a year abroad in Montreal would look like. This experience could potentially be a great advertising tool for students to study abroad in Montreal. There are some bugs in current VR tech that must be worked out before they can be completed. One of the biggest bugs that VR technology has right now is that players may experience motion sickness as they move through the game, since they are not physically moving when they are moving in the game. For some players, the more they use VR, the less sick they become, but for others, they are affected each time. “The first time you go into VR, it’s either going to be exceedingly mind-blowing or exceedingly sickening. Then once you get past that first hurdle, it becomes easier to understand [the difference between what you’re seeing and what’s there],” said EMC’s Olfactory lead interactive UX designer Steven Margolin. 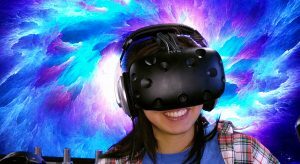 Many of the EMC students believe that VR technology will catch on more in the next few years as the headsets become much more affordable to the average consumer. But for now, one of the more affordable options for players to experience VR is to go to arcades such as Vermont Gaming Lounge, VR Junkies or The VOID. 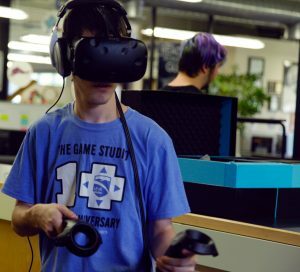 VR Junkies and Vermont Gaming Lounge offer players a variety of games throughout multiple genres such as survival, space adventure and even mini-golf! Players pay by the minute and depending on the game choice, can play alone or with their friends. The VOID Virtual Entertainment Center (VEC) works differently, as people have to purchase tickets for certain games, and then play the game in an arena. The arena-play style allows the player to touch and interact with objects as they play with friends in the universe of their choosing. So far, arena-style gameplay from companies like The VOID are considered the most immersive VR experiences. However, Steven believes that these arcades could be the first step toward home VR systems as they increase awareness of and demand for the technology. VR technology has endless possibilities in various industries besides gaming. Medical schools are using VR technology to practice surgeries; emergency personnel use VR to prepare for disaster relief efforts; and some doctors are using VR and robotics to improve stitching. There are even companies that are testing VR therapy to reduce pain in patients. The only certainty about VR is that the technology is only going to advance. Check back in this Friday when I explore the increasing usefulness of 3D printing in studios and manufacturing. This entry was posted in In the EMC, Innovate and tagged https://www.cedarpoint.com/blog/iron-dragon---virtual-reality-roller-coasters on July 31, 2017 by Sarah Jerger.